Home E: Lifestyle Was your dentist there? Two weeks ago I attended the 30th annual Greater Philadelphia Valley Forge Dental Conference. This annual meeting of the dental community is primarily focused on continuing education. As a member of the organizing committee I had a chance to speak with dentists, vendors and staff. This conference focuses on ADA member dentists in Chester, Delaware, Montgomery, Bucks, Lehigh and Northampton counties. One conversation was extremely interesting and is what I want to talk about in my column this month. The gentleman I was speaking with had been hired to provide security for our exhibit hall. His first comment stopped me in my tracks. He said “I never knew there was so much more to dentistry” I asked what he meant and he listed a litany of things we do each day as a matter of course. 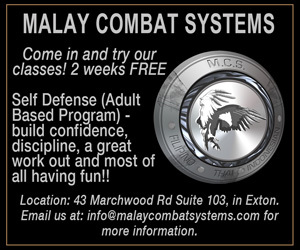 He never knew we needed to take advanced courses to renew our license. He was shocked that we had to worry with computer systems, financial processing people, instrument vendors, equipment and equipment maintenance. He was amazed at what was involved in “participating” with an insurance company. He took me aside and said very sincerely that he had a new found respect for the dentist he has been seeing for years. Like most patients, the hours of work behind the scenes is rarely seen. Patients often never know the cost in time and money keeping a dental team current on all of the regulatory requirements. He pointed out that he had no idea how much money a dental practice spends on things like toothbrushes and dental floss. (No we don’t get samples to give away). It never occurred to him that his corner dental office was equipped much like an operating room. He had no idea that dentists spend thousands of dollars on recycling dental amalgam, arranging for the transport and manifest requirements of the biohazard materials. What really surprised me was that he never considered the financial impact of a missed appointment or no-show. The assistant, front office staff and overhead still need to be paid. He learned a lot by watching hundreds of dentists, hundreds of dental team members and other support staff walks past his station for 3 days. Day in and day out the average dental office does hundreds of jobs behind the scenes. Some of the value of the conference is learning ways to do these tasks, better, quicker and more cost effective than before. The dental conference was more than just chatting with a security guard (off-duty policeman to be more precise). We had nationally respected speakers give presentations on laser periodontal therapy, new dental materials, and how to improve our imaging technique just to name a few. Our exhibit floor boasted vendors from dental supply companies, dental instrument manufacturers, insurance company representatives, toothbrush manufacturers, dental magnification companies and much more. These meetings are important for dentists, especially those who practice alone or in small group practices. We “don’t get out much”. It’s really important for a dentist to spend time with their colleagues, collaborating, learning and sharing new ideas. Imagine if dentistry today was the same as it was even 50 years ago? The dental profession is changing fast and it’s important to know that your dentist is keeping up. Dr. Stephanie McGann, who has more than two decades of dental practice experience, is a resident of the Unionville area and along with her partner, Dr. Marie Scott, operates The Brandywine Smile Center, a family-friendly dental practice in Concordville. 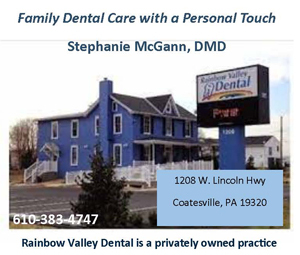 Dr. McGann has opened a new practice in Valley Township, Rainbow Valley Dental. She is a Fellow of the Academy of General Dentistry.